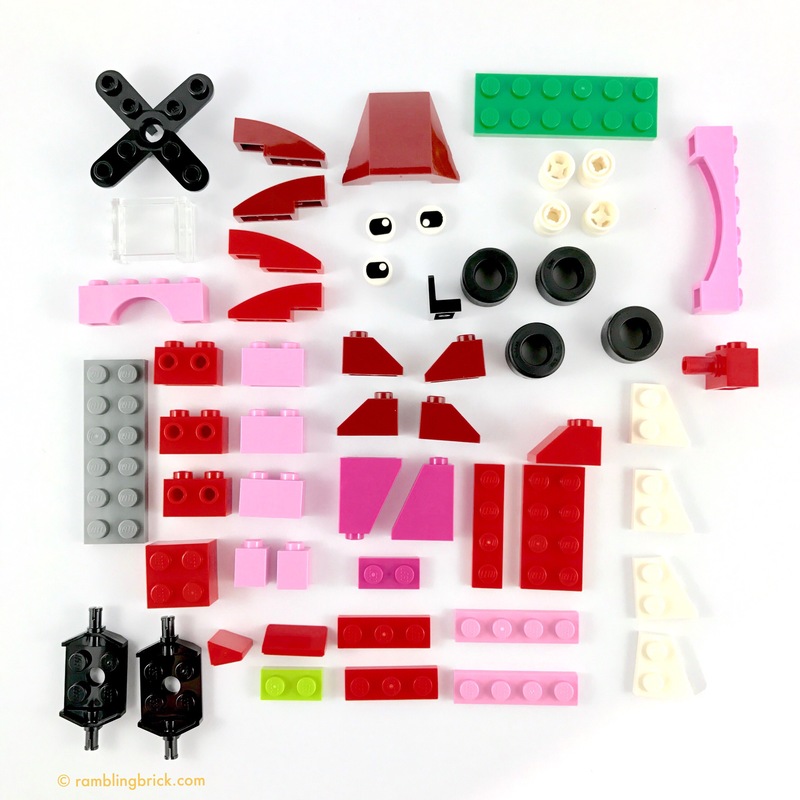 When the LEGO® Classic sets were launched in 2015, they promised an invigorated era of sets where bricks, plates and miscellaneous bits were what counted. It felt like a return to the Basic Building Sets of the 70’s, although the evolved part and colour palettes see us now having access to a veritable cornucopia of colours, shapes and opportunities. Not so many options, however, that we don’t need to come up with creative solutions. All of the Classic sets come with an ‘inspiration book’ – typically including a selection of models that can be constructed simultaneously. The boxes are typically illustrated with a rainbow like arrangement of the pieces, according to colour. I was not prepared for their size, or price tag. I hadn’t anticipated that these would be Pocket money sets – around 50 to 80 pieces per set, priced with a recommended retail price of $AUD7.99. I had expected something a little bigger, and more expensive. On the the shelves at K-Mart (imagine walmart or Target, but Australian and possibly a little smaller) they retail for $AUD7 even. I decided to pick up the blue box initially, as it had the nicest rattle. It also featured a nifty looking railway engine with pearl silver wheels, like a scaled down version of 31054 Blue Express, in this year’s Creator range. So I took it home, and opened it up. The first thing that struck me about the 10706 Blue Creativity Box was the variety of colours to be found in it: bright blue, dark blue, medium blue, medium azureas well as transparent blue. And there were some black, white, grey and transparent clear pieces; and the pearl silver wheels (without tyres) as well as a couple of yellow and flame yellowish orange pieces. The contrasting colours enhance the models as they get built. This is a small set, and all of the pieces to be found in it can be seen here. Of note are the white round ‘eye’ tiles. an animal, different eyes, and different types of black and white pieces. You can collect all of them, and have very little excessive doubling up of unnecessary parts. Then I saw the Red Box a little more closely: on the box was a picture of a crab with, I presume, a piece of seaweed in one claw. He has eyes I haven’t seen before – they look a little more dazed and confused if oriented one way, and a little suspicious if oriented the other. I picked the box up, handed over another $7 and headed home. This handing over of $7 is a bit metaphorical. In reality I waved a credit card over a computerised terminal and was magically greater in debt. Opening up the the 10707 Red Creative Box I found the piece count to be a little lighter than the Blue Box, and wondered what else might be different. I took the necessary knolling photograph and set about constructing the inspiration models…without using the instructions! Windmill, crab and racing car. The Red and Blue Creative Boxes were both released as part of the LEGO® Classic range in February 2017. They are both inexpensive, priced at $AUD7.99, and come in a cardboard box. Inside are two polybags containing parts and an Inspiration manual, with instructions for 3 models. these models can all be built simultaneously. Although the same price and package size, the Blue set contains 78 and the Red box 53 pieces ( according to the inventory). Both contain an extra ‘eye’ tile. Both sets contain pieces in a variety of hues, based on the primary color of the box, as well as a selection of white, black and grey pieces. There are also a few complementary colors to the primary color. Colours featured in the Blue Creative box are bright blue, medium blue, medium azure, earth blue, transparent blue and transparent flourescent blue. These are contrasted by bright yellow window shutters, an orange 2×2 round tile with hole, and a yellow 1×1 cone. There are some black axle plates, grey 2x 6 plate, white bricks (1×2, 2×2) and pearl grey wheels. The Red Creative Box features bright re, new dark red, bright purple and light purple. The contrasting plates are bright green, and bright yellowish green. There are also black, white and transparent elements in the red set. Pieces in the Blue creative box. include a number of round tiles, slopes and invest slopes as well as curved bricks. 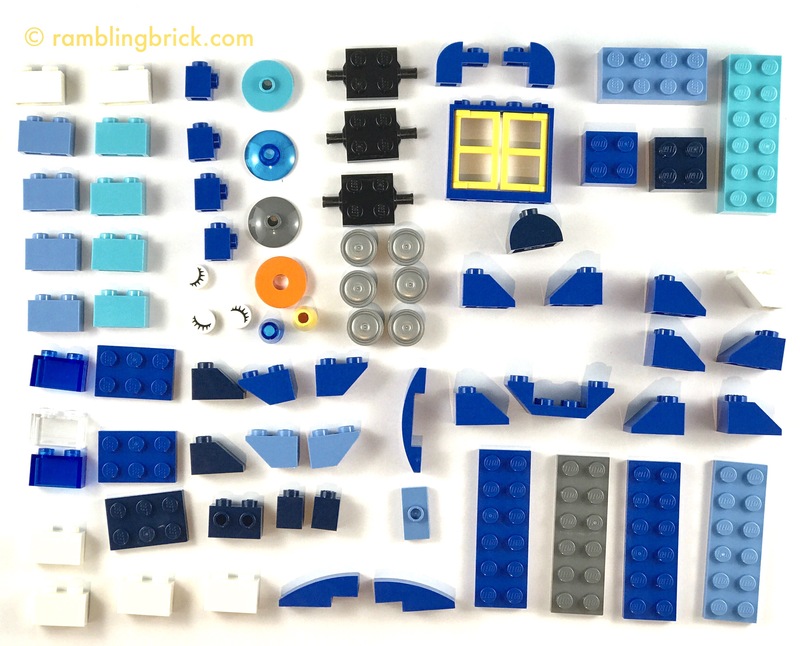 There are 1×1 bricks with studs on the sidein bright blue, as well as an earth blue 2×1 brick with studs on the side.there are 4 2×6 plates and a number of bricks, including 1 2×6, 1 2×4 and 2 2×2’s. The rest are 1×2 bricks. The Red creative box, however, contains a 4×3 wedge brick with no studs, as well as a number of curves and also several 45º and 70º slopes. Arches, 4 and 6 studs wide, are also present in this set. There is a red brick with a peg on the side to allow connection of the black propellor element. Offset positioning can be achieved in the Blue set with a 1×2 offset tile, a 2×2 curved brick with 2 studs, or a 2×2 round tile with a single offset stud. No offset bricks are offered in the red Creative Box. SNOT Elements in the Red Box are limited to 3 2x1bricks with studs on one side. The Blue Box features one earth blue brick with 2×1 brick with studs on the side, and four bright blue 1×1 bricks with a stud on the side. Also of interest…There are 4 Right 2×2 wedge plates. There do not appear to be any left wedges present in the other color creative boxes. Four white wheels all have tires, compared to the tireless pearl grey wheels in the Blue Box. Eye tiles (1×1 round white tiles) in the Blue Creative Box have a ‘closed eye’ print, while those in the Red box have what appear to be a unique (at this time) print, of round pupil, with the sides of cut off. Value for Money: both sets have identical prices. At 78 pieces the blue box averages just over 10 cents per piece, while the Rex Creative Box averages a little over 13 cents per piece. I believe a better value/price point exists with some of the larger Classic sets. Both sets are great, however, for providing a collection of varied, color themed pieces for a reasonable price, especially if below the listed RRP. Each of these sets earns three and a half out of five Arbitrary Praise Units, losing out particularly in the relative cost per piece. The concept is solid, but the price/piece could be a little better. Perhaps my exam technique is a little out of form: it took me 40 minutes, and I’m sure I missed something important. Then I needed to go back and correct the grammar and spelling. As well as these two creative boxes, they also come in Green and Orange. Do these sets hold appeal to you as an AFOL? Do they make up for the loss of Mixels? Will you get these, or look at the larger Classic sets? Why not leave comments below, and follow the blog on email or on the Rambling Brick Facebook page. Follow @ramblingbrick on Instagram where you will find other nifty features such as legography and previews of upcoming blog articles.